Imagine sitting down comfortably with a nice pattern, some thick yarn and your size N crochet hook, all ready to go. But there’s a problem: the yarn seems to be too thick. It just doesn’t really work. You check your yarn, it’s ‘jumbo’. This means it should be suitable for a hook size of 15mm. And a size N crochet hook is the same as a size 15, right? That’s true, but confusingly enough, a US size 15 corresponds to a crochet hook with a width of about 10mm. So why isn’t a size N crochet hook called a size 10 crochet hook? We don’t really know, but we do know a US size 10 crochet hook is about 6mm in metric size. Are you still with us? As you can tell, crochet hook sizes can be a bit confusing to say the least. If you’re new to crocheting, all the different hooks and yarn in combination with the different methods of sizing can be quite overwhelming. The letters and numbers going up and down don’t always seem to make sense. 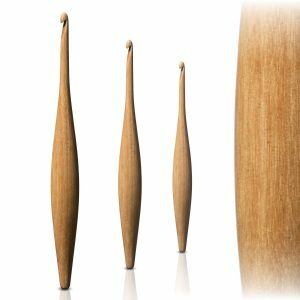 The sizing of crochet hooks differs per country, and to make it even harder: sometimes even per manufacturer. The package sizing in mm is always the most reliable, since this is an accurate measurement. It’s best to always look carefully at what you’re buying, and double check if you’re in doubt. 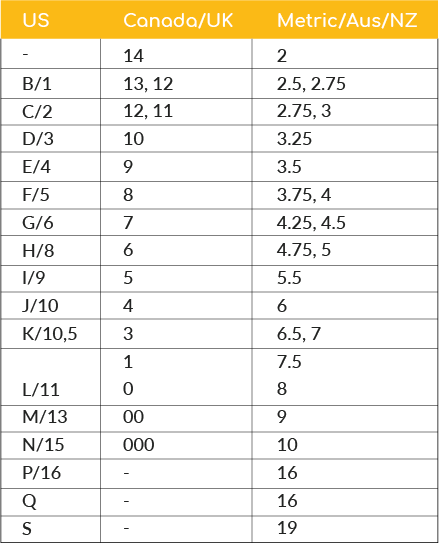 That being said, a conversion chart can come in handy as a general guide when you’re looking to buy crochet hooks. Now you can easily check how many mm that pretty size N crochet hook is that you spotted. Good luck and happy crocheting!